Strong earnings and encouraging economic news from China brightened the mood on Wall Street Thursday. A jump in shares of Apple (AAPL) helped too. And good news from the tech sector kept coming after the market closed. Microsoft (MSFT) reported earnings and revenue that easily topped expectations, sending shares nearly 6% higher in after-hours trading. Amazon (AMZN) reported a quarterly loss that was in line with forecasts. But sales topped estimates and Amazon's stock surged more than 7% after hours on the news. Also after the bell, Twitter said it will offer 70 million shares at range of $17-$20 a share in its upcoming initial public offering, which would value the company as high as $10.9 billion. Before the flurry of tech news, the Dow Jones industrial average jumped nearly 100 points, or 0.6%, in regular trading. 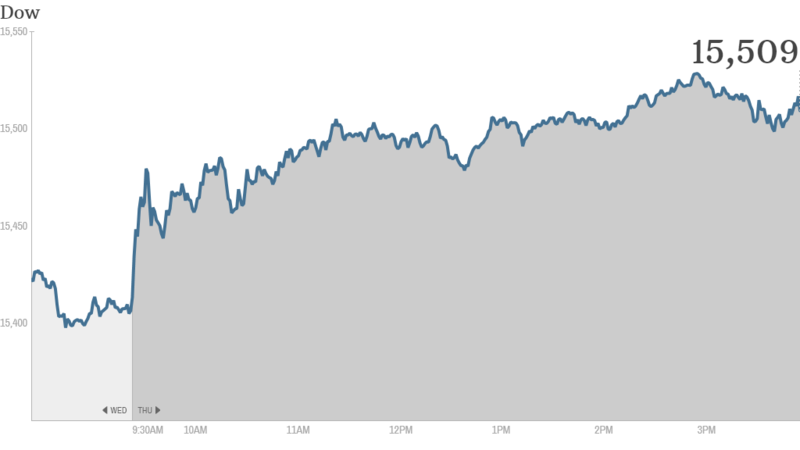 The S&P 500 rose 0.3% and Nasdaq gained 0.6%. In a sign that manufacturing is improving in the world's second largest economy, Chinese factory activity hit a 7-month high in October. The positive data follows last week's upbeat report that showed China's economy great 7.8% during the third quarter. Icahn boosts Apple: Shares of Apple rose 1.3% following the news that activist investor Carl Icahn sent a letter to CEO Tim Cook reiterating his push for a big share buyback. The gains briefly put Apple's stock in positive territory for the year for the first time since Jan. 4. Shares have rallied almost 40% since the they slid below $400 in April. In his letter, Icahn said he boosted his stake in the company to 4.73 million shares, and remains convinced that apple should launch a $150 billion buyback program. Traders seemed to be on board with Icahn, and are looking forward to Apple's earnings next week. "$AAPL starting to move like it used to with Icahn calling buyback a "no brainer," said StkCon. "Now, let's hope for good earnings!" Some traders had lofty predictions. "$AAPL With the blow out earnings it will rocket to $600.00 by Christmas," predicted fishobass182. "$AAPL I love being part of history, a year from now will look back and say wow what an epic run post/ after earnings that was. Bullish," said win2betmore. A big day for earnings: Dow components 3M (MMM) and AT&T (T) reported better-than-expected earnings. But shares of Ma Bell declined almost 2% while 3M rose slightly. Ford (F) shares rallied after the automaker raised guidance and released quarterly earnings and revenue that topped forecasts. Rival GM (GM) rose on the news as well. Investors were particularly encouraged by the fact that Ford once again trimmed its ongoing losses in Europe and raised its earnings guidance. "Second consecutive upside surprise from Europe at Ford," said StockTwits user retail_guru. "Faster improvement = unqualified great news $F." 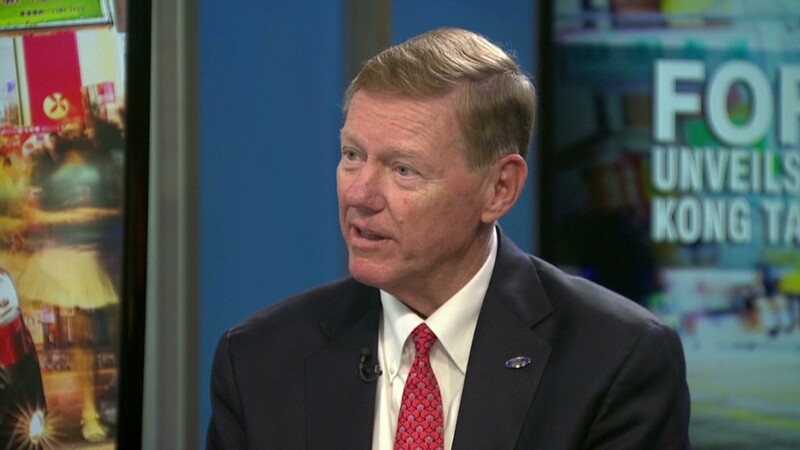 On Ford's earnings call with analysts, CEO Alan Mulally also tried to ease concerns that he may leave the automaker to take the top job at Microsoft (MSFT). PulteGroup (PHA) shares were also on the rise after the homebuilder's earnings and revenue topped forecasts. Southwest Airlines (LUV) gained ground after the discount airline reported solid earnings thanks to higher airfares and declining fuel costs. Southwest was optimistic about the current quarter, highlighting that bookings for November and December are strong. On the downside, shares of Symantec (SYMC) got hammered after the company reported earnings and sales that fell short of estimates, and slashed its guidance. The chairman of StockTwits noted that Symantec has not been as adept as Adobe (ADBE) in adapting to new trends. "$SYMC thank goodness i gave up on this a few weeks ago...have not made the $ADBE like transition to mobile and the cloud...ugh," said howardlindzon. Dow Chemical (DOW) shares also finished lower after the company's earnings fell short.